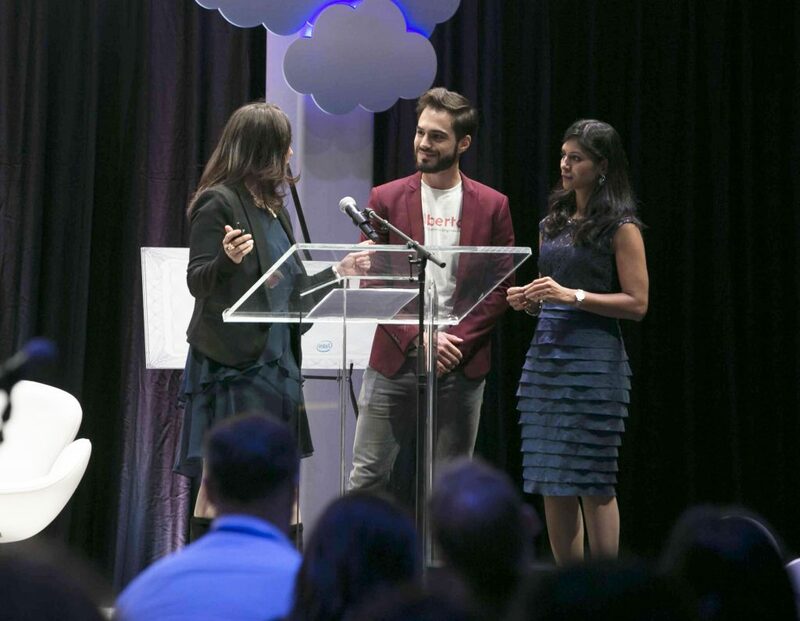 Holberton’s efforts were recently recognized at the CloudNow Top Women Entrepreneurs in Cloud Innovation Awards hosted at the Facebook campus. 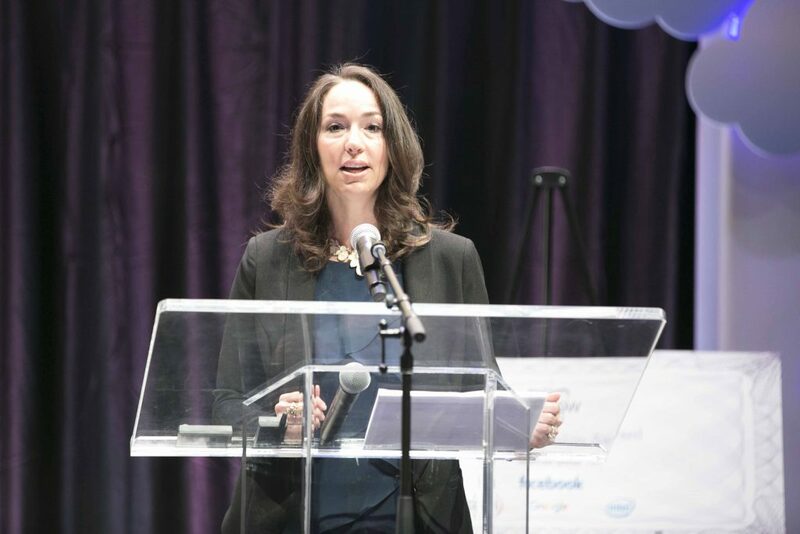 The non-profit consortium of the leading women in cloud computing and converging technologies that is supported by Facebook, Google, and Intel. CloudNow’s STEM scholarship was generously awarded to 9 of our students to assist with their living expenses while studying at our San Francisco campus. Previous scholarship recipients at Holberton School went on to work at Change.org, Apple, Pinterest, Doctor on Demand and more. 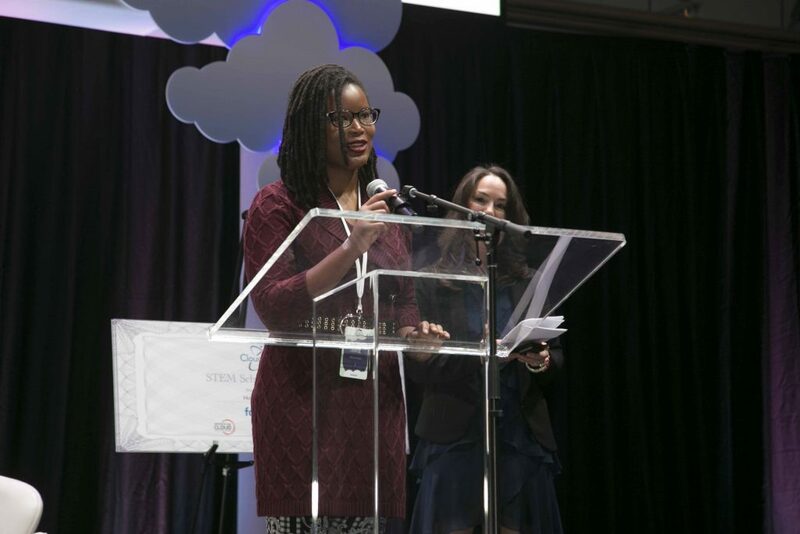 The CloudNOW STEM scholarship program doubled its support this year, awarding 50 percent more individuals with opportunities to pursue an education as a software engineer. We here at Holberton School are grateful for CloudNOW’s ongoing and increasing commitment to improving opportunities and diversity in STEM. Facebook COO and women’s advocate Sheryl Sandberg also attended to recognize the mission of Holberton School to get more women in tech and congratulate the Holberton students who received scholarships. Sheryl emphasized the fact that diversity is not only a social imperative, but that diversity and fair gender representation has broad, positive economic benefits for any business that embraces it. 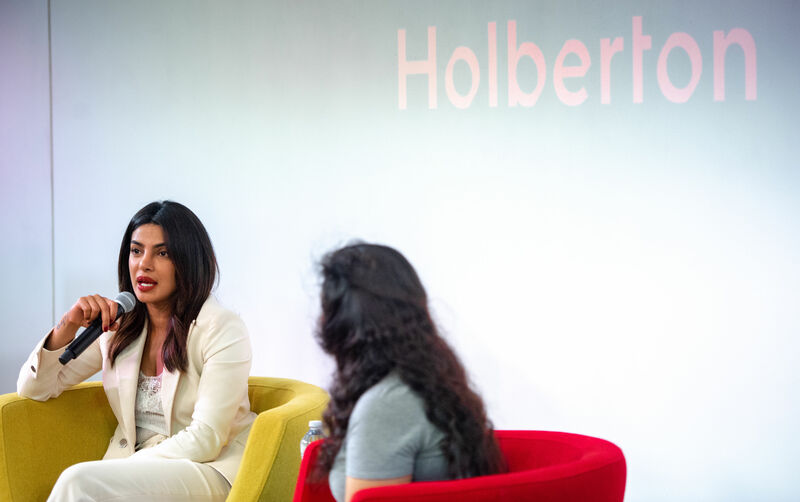 Holberton School’s mission and commitment to developing and encouraging a more gender-representative world of tech has received praise from leaders in the equality space like Priyanka Chopra and Melinda Gates. These work of these luminaries, along with the support of organizations like CloudNOW, helps Holberton School to increase female participation in tech and STEM. “We applaud the achievements of our winners, and thank them for blazing trails for diversity, inclusion and entrepreneurship. We also honor our STEM scholarship recipients as we work together to support the next generation of tech leaders.”–Jocelyn DeGance Graham. Please join me in congratulating the CloudNow scholarship recipients, and stay tuned for these future innovators to make waves in STEM and tech! Many think that becoming a software engineer is reserved for math geniuses who spent their lives in front of a computer – “I am not smart enough for that.” Yet, the stories of countless Holberton School students show that their background does not matter and that they have enough motivation and passion; that becoming a developer really is possible. Dora Korpar is one of these stories. She first came to Holberton with no former coding experience but went on to become a software engineer at a San Francisco startup. And now, Business Insider has decided to highlight Dora’s amazing story. About four years ago, Dora Korpar was looking for her next adventure. She had finished college but could not find a job and wasn’t interested in continuing her college studies. To pay the bills, she took a job at Trader Joe’s. As she was catching up with a friend, he told her that he had recently got a job as a software engineering at Apple. He was a philosophy major in college, so Dora knew he never studied Computer Science. That intrigued her and she realized that she too could give it a shot. She decided to apply and the application process, which guides candidates to build their first website, sealed the deal; she loved coding. She was accepted, and, long story short, Dora is now a software engineer at Scality, a San Francisco storage company. She could not be happier with her decision to attend Holberton. If you want to read more about Dora’s story, check out the Business Insider article! Holberton School is opening in New Haven, CT! Our world is entering the fourth industrial revolution, led by software, automation and artificial intelligence. Companies, to survive, have to run at the pace of technology and leverage these tools, or risk becoming the next Blockbuster or Kodak. They need a workforce that is skilled and able to constantly retrain and retool. Our post-secondary education, that was really developed during the last industrial revolution, is falling behind on equipping today’s students with the skills they need to thrive. Some institutions have managed to adapt – but only for the elite. Only a fraction of Americans can access this Ivy League club. Tech companies, and really any company that is going through a digital transformation, is suffering from the lack of a trained and diverse workforce needed to take over 500,000 open positions. That’s what Julien and I decided to tackle by founding Holberton in 2015 – provide high-quality education to the many. We took inspiration from progressive education, a movement that emphasizes learning by doing, problem-solving, critical thinking. A movement that leads students to develop their social skills and become lifelong learners. 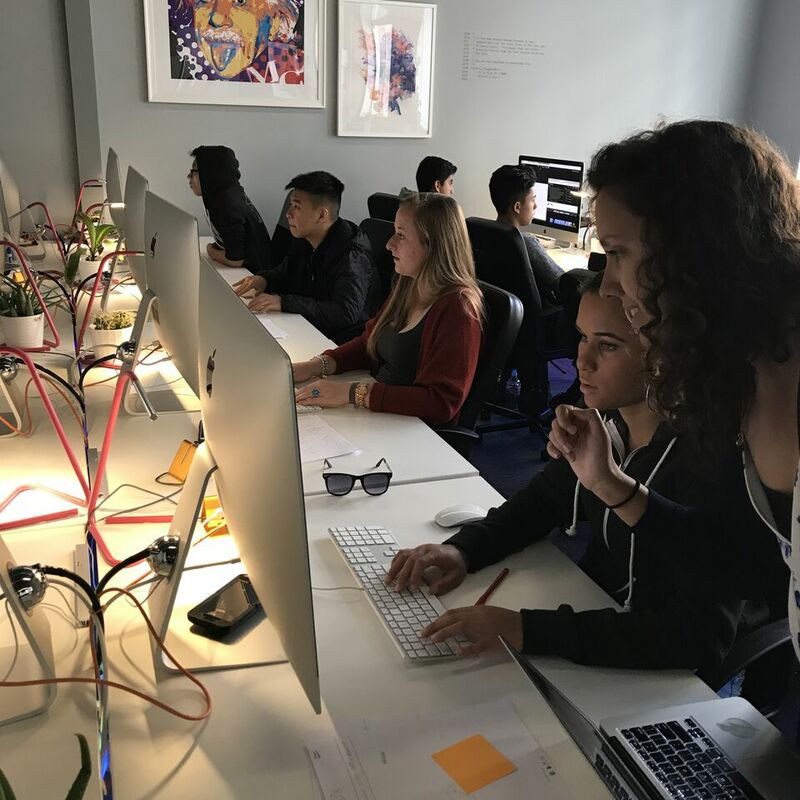 We wanted to make sure that the Holberton opportunity was accessible to anyone motivated to become a software engineer. We designed a free and blind admissions process selecting on grit, and made the school free until students find a job. We welcomed our first cohort of 30 students in January 2016 and since moved to a new building that can accommodate up to 1,000 students every year. We have alumni working in Silicon Valley’s top companies including Tesla, Apple, LinkedIn and Facebook. 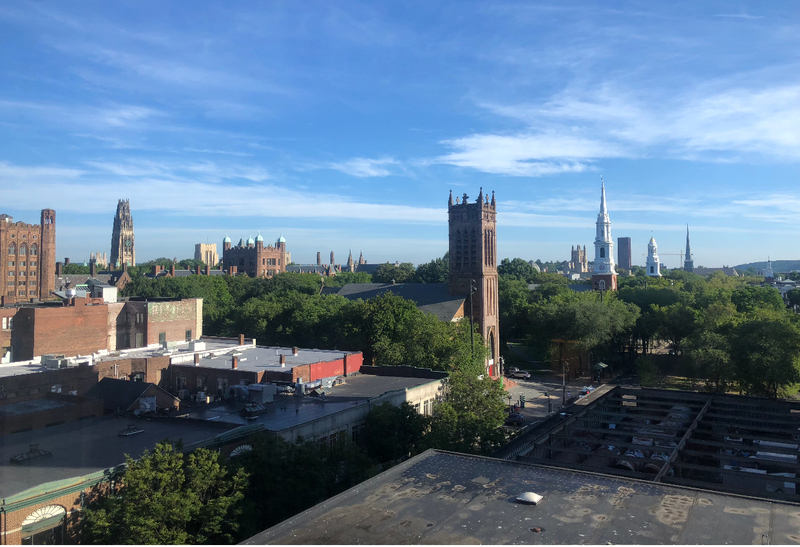 Today, we are making the Holberton School opportunity accessible to even more Americans by opening our second campus in New Haven, Connecticut. Connecticut has always been known for innovation. Leading in insurance, and a major actor for aircraft & parts manufacturing and ship & boat building. Technology-related jobs grew by an estimated 1,060 jobs in 2017 and contributed $16.2 billion to the state’s economy. 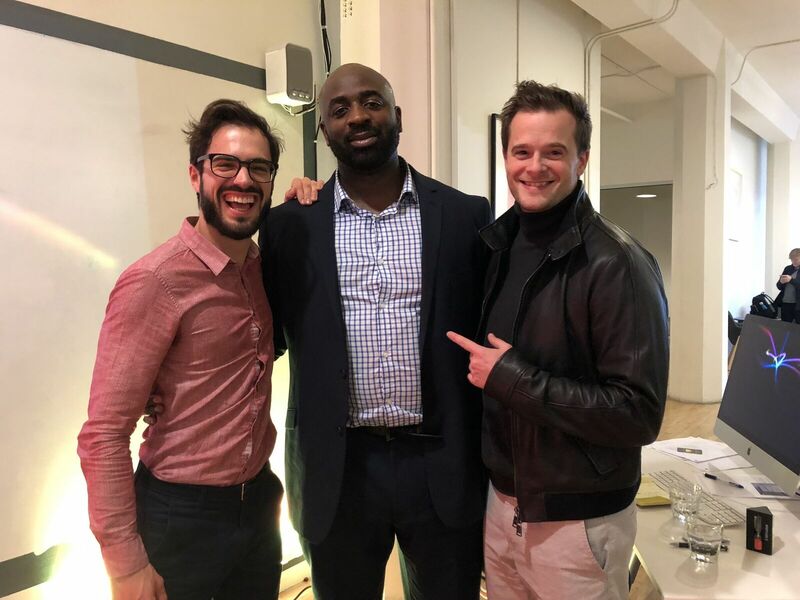 In this context, Holberton will both help local companies to successfully navigate the digital transformation they are going through by providing the talent they need and also attract businesses to join the area, as the war for highly-skilled talent rages nationally. New Haven’s low cost of living is also a big advantage. While the Silicon Valley is providing countless advantages, the cost of living can sometimes prohibit potential students from attending the program. We have been working hard for months along with David Salinas and his team at District to make this happen, and we expecting to welcome our first cohort of students in January of 2019. Thanks to Comcast, CT Next, District Innovation & Venture Center, Indra and Raj Nooyi, Seedlings Foundation, State of Connecticut, and The Community Foundation for their support. Enrollment have started, apply here! 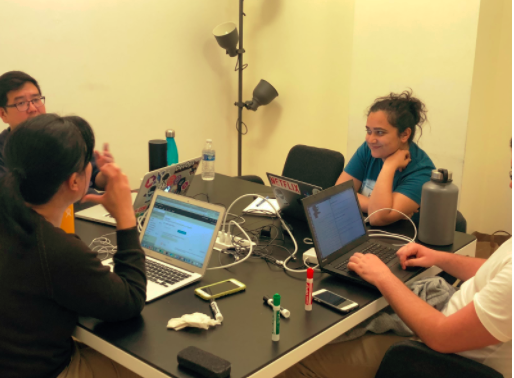 Holberton School students recently participated in a 24-hour Docker Hackathon! While there were various cool hacks, there were a few that stood out; placing these teams as 1st, 2nd, and 3rd place winners. 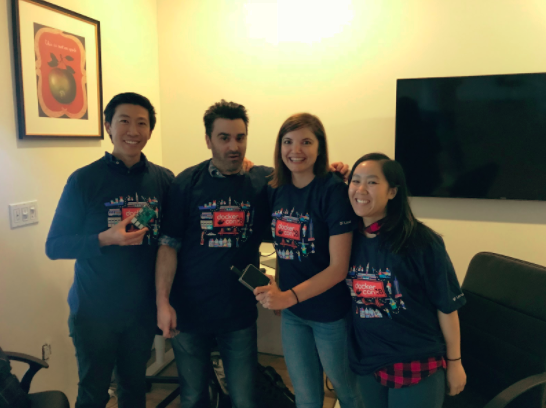 Let’s take a look at the hacks that won these budding software engineers tickets to the most coveted container community event in tech – DockerCon! Isaiah Becker-Mayer, Spencer Taylor, and Nick Teixeira: We wanted to make a container image that would act as a data science lab that you could work out of. It’s really hard for people who work with data to recreate the same circumstances that produce a given result. Different operating systems and computer specs make this really difficult. Using the container you’re able to save a snapshot (Docker Image) of your current lab with the same operating system and specs, and send it to your colleagues so they can reproduce the results. David Yoon, Sue Kalia, Yunju Chen: Docklio! (the name comes from Docker + Twilio) If you already have your Docker environment set up, how about deploying your app with a single push of the button? That’s what we want to achieve with Docklio — to make system admin’s lives easier. Docklio allows users to control their Docker containers by sending text messages and Docklio will send back a message to confirm the container status. Katya Kalache, Kim Wong, Spencer Cheng, Stuart Kuredjian: Our goal was to learn more about how Docker can enable a scalable distributed system on both virtual and physical machines. We decided to run a image recognition model using three Raspberry Pis and set up a three node swarm cluster using Docker. One node was set up as a swarm manager which executes and distributes commands to the two worker nodes. We also explored the OpenFaaS framework, developed by Docker Captain Alex Ellis, a scalable framework for building server-less functions with Docker swarm. These hackers have skills and will soon be in search of their first software engineering gigs! Thanks to folks like our mentors and volunteer hackathon judges, these students are able to fine tune their skills with the advice of industry professionals! Shoutout to Mason Fish and Andrew Hsu for volunteering their Saturday afternoons to help judge the hackathon presentations! The support these two gave to the hacking efforts will not soon be forgotten! Camden, New Jersey, if you’re not familiar, has at times been branded as ‘America’s most dangerous city.’ Max Johnson, if you’re not familiar, has at times been labeled Holberton School’s hardest working student. What does one have to do with another? Max grew up in Camden, NJ and in true poetic fashion, as his city experiences some positive changes, so does Max’s career trajectory. In spite of the fact that Max had earned a degree in Criminal Justice and Psychology he struggled to find a related job in the field. He decided he was not going to let his tough surroundings dictate his future path and began looking into the prospect of breaking into the tech industry. Max was rejected by every program he applied to up until being admitted to Holberton School. We are not our past. With this notion, Max set off to the west coast with a few thousand bucks, and the determination that he would come out the other side a full stack software engineer. However, the path to success was not paved with ease for Max. During his tenure at Holberton he experienced a few personal hurdles. These struggles coupled with the challenging curriculum eventually taught Max, arguably, his greatest lesson- it’s ok to ask for help. “My classmates had my back. 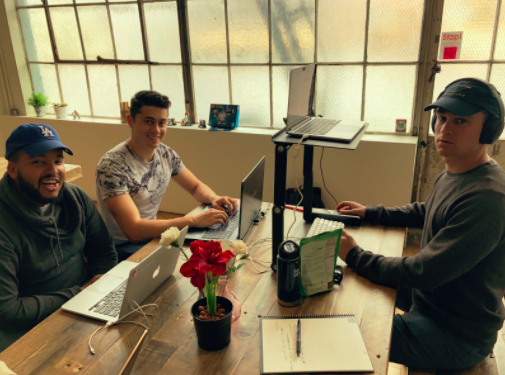 They helped me, they supported me, they stayed with me after hours,” The peer learning structure and collaborative nature of Holberton School’s curriculum allowed for the network of helping hands that Max needed. Holberton’s curriculum is unique in the way that it’s continually iterating based upon feedback from mentors and industry trends. Mentors are professionals working in the Tech industry, from small companies like Gandi and Scality, up to the Facebook and Google of the world. It is our pleasure to welcome new mentors to the Holberton family. We’re excited about the varying areas of expertise these tech professionals will be joining us with. Evelyn is a Data Privacy and Security Strategy leader who serves as an advisor to several startups and has been overhauling and re-institutionalizing security and privacy in the smallest to the largest organizations in order to protect user’s personal data, as part of her consultancy. 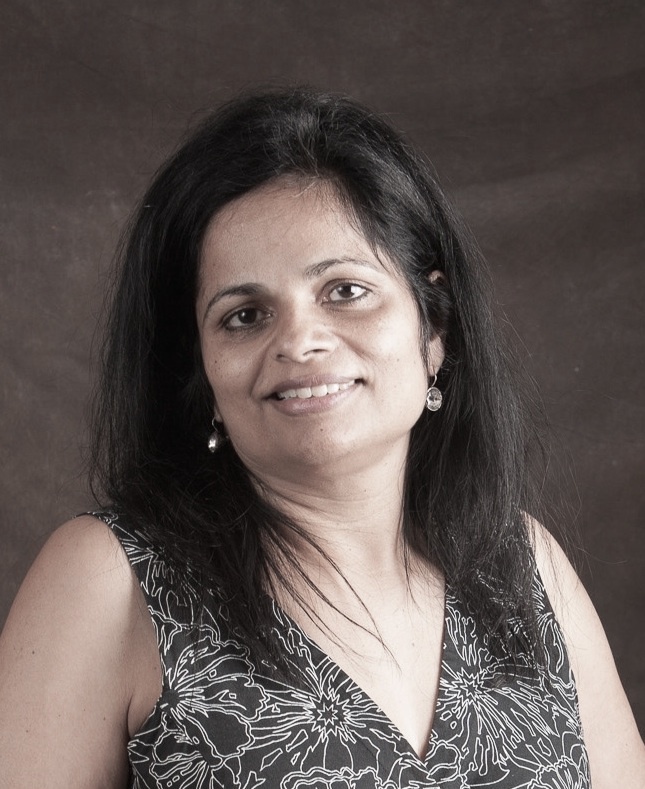 She has been recognized as one of the Top 10 Women in Cloud by CloudNOW and as a Silicon Valley Business Journal Woman of Influence. During a sabbatical last year, Evelyn took six months to launch a non-profit affordable housing initiative in her community which has become the launch pad for her next generation community concept. Michael is a Staff Site-Reliability Engineer (SRE) at LinkedIn working with various teams within the company to improve their operability experience. Thanks for Michael that your favorite professional social network is always up and running. 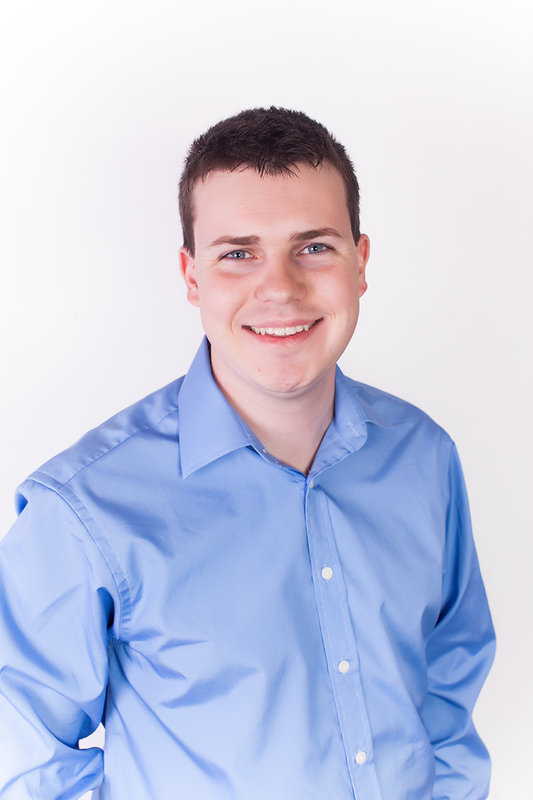 Michael has experience in systems engineering from frontend proxies to backend databases. Before joining LinkedIn, Michael interned at NASA working on the PhoneSat project. Paul is an autonomous drone software architect and drone big-data analyst for Intel. One of his projects is working with Intel clients to analyze data gathered from drones with computer vision, 3D reconstruction and deep learning using Intel Insight, Intel’s drone data solution. Another one is designing autonomous drone solutions for complex cases like indoor navigation and delivery fleets. He started as bioinformatician in human biotech for 8 years, then moved to tech to focus on high-performance computing and IoT. He is now helping Intel partners build autonomous and data driven drone solutions. 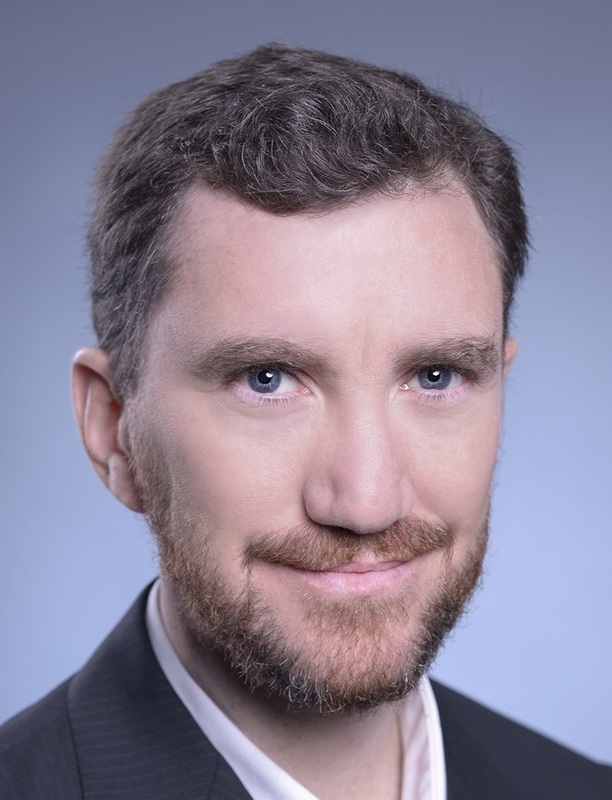 In his spare time, Paul is a pedagogical consultant for higher education and is teaching Entrepreneurship and Innovation at Toulouse University in France. 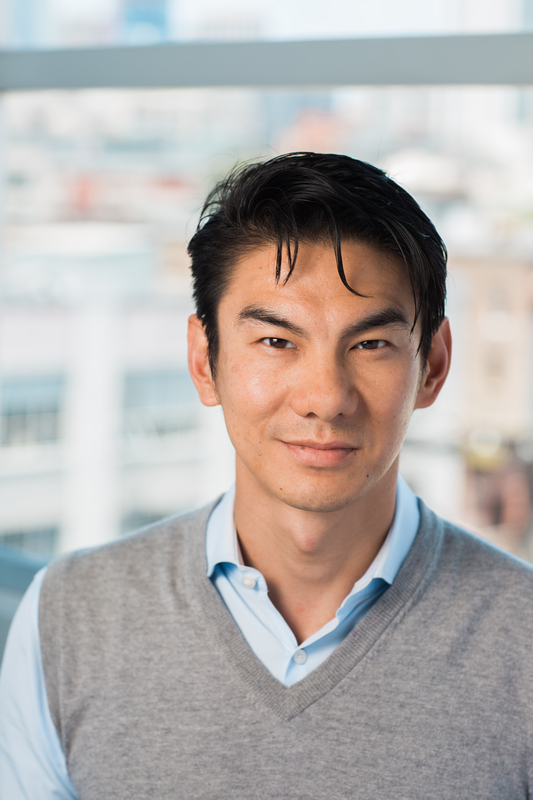 Han, the Senior Vice President of Engineering at Upwork, has joined the mentor team at Holberton School. Han has a genuine interest in alternative education models. “Knowledge pays dividends for the rest of someone’s life.” In joining the mentor team, Han hopes to help pass along the valuable knowledge he’s gained over his 19 years working in tech. To Han, mentoring can be both personally and professionally gratifying adding that Holberton School is cultivating a strong and diverse talent pool. We are proud to offer a malleable mentor program in which mentors have the opportunity to choose what areas they want to help with as well as how often they would like to be involved. If you’re interested in becoming a mentor at Holberton, check out the info here. We’ve said it before and we’ll say it again; the varied student body is an integral ingredient in our Holberton School’s secret sauce. We look forward to having more high school students like Corbin Coleman join the Holberton School community. I caught up with Corbin over a complimentary (and tasty!) lunch at Docker HQ to chat about his time at Holberton, his internship at Docker and how his hard work has recently paid off with a transition from intern to full time software engineer! 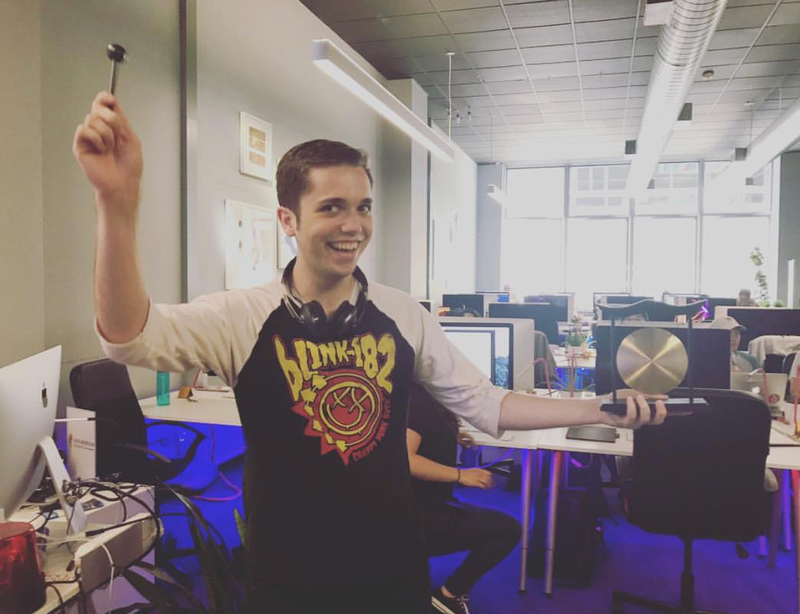 Corbin ringing the Job Gong @ Holberton School, signaling he landed an internship! Not unlike many 20-somethings, while attending community college Corbin was working as a server during the “in-between” time after high school. It was during this time Corbin discovered Holberton School. “My dad first introduced me to Holberton. Then he explained to me that this school was the direct opposite of everything I didn’t like about traditional education.” This was the type of program Corbin could see himself succeeding in being that Holberton’s education model follows a project based and peer learning structure. Fast forward to the point of the internship period in Holberton’s curriculum. “One of the key elements that got me prepared for job interviewing was white boarding.” Corbin explains that the built in technical interview practice increased not only his whiteboarding skills, but his confidence. 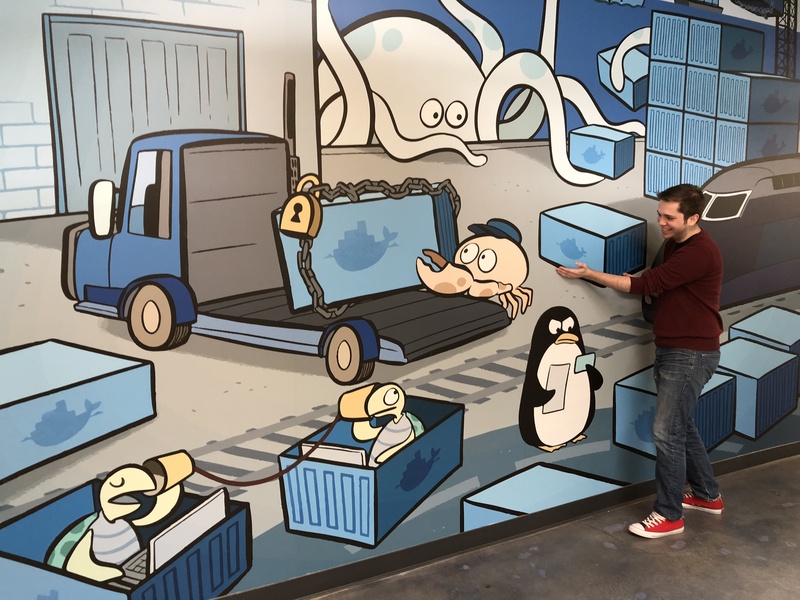 Corbin helps the container crew @ Docker HQ! “Beyond the technical concepts, Holberton does a great job of making it [school] feel like what work feels like.” Corbin noted that the peer based learning structure prepared him to work on the software engineering team he’s a part of now in one of San Francisco hottest startup, Docker. “I learned how to communicate with people that didn’t come from the same background as me.” We’re increasingly seeing the trend in Silicon Valley of skills, not (necessarily) degrees. The soft skills we bolster at Holberton School bring that phrase to life and Corbin is here to prove it. We are excited to be settled into our new home in San Francisco’s SoMa neighborhood! Our new spot boasts plenty of comfy nooks for studying, meetings, and even relaxing. Our spacious digs provide us with plenty of room to grow and welcome more students into the Holberton School family. We feel right at home in our new space, located on Mission and 5th/6th. With neighbors like Slack, Eventbrite, Yahoo, and Y Combinator, the networking possibilities are endless! 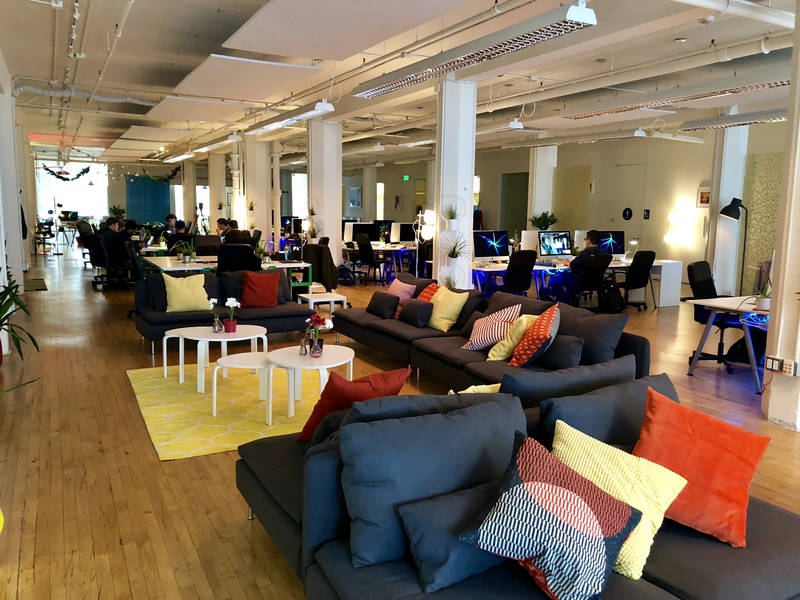 Soft seating and iMacs abound in Holberton School’s new space! It has been with tremendous gratitude that we have partnered with Google, Scality, Accenture, and CloudNOW to present Holberton students with scholarships to alleviate the cost-of-living associated with the San Francisco Bay Area. 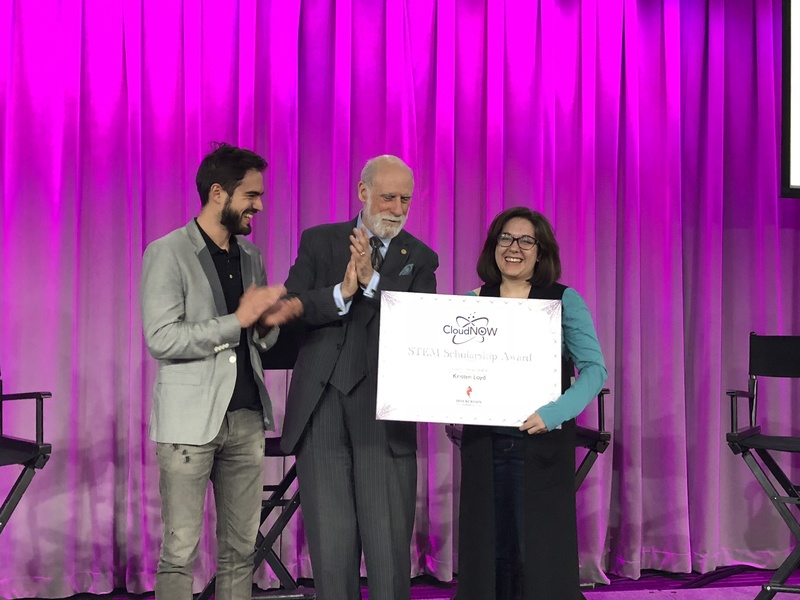 These scholarships were presented to students at Google’s annual #TopWomenInCloud event by Vint Cerf, father of the Internet and inventor of the TCP/IP technology. Holberton School students are tenacious by nature. 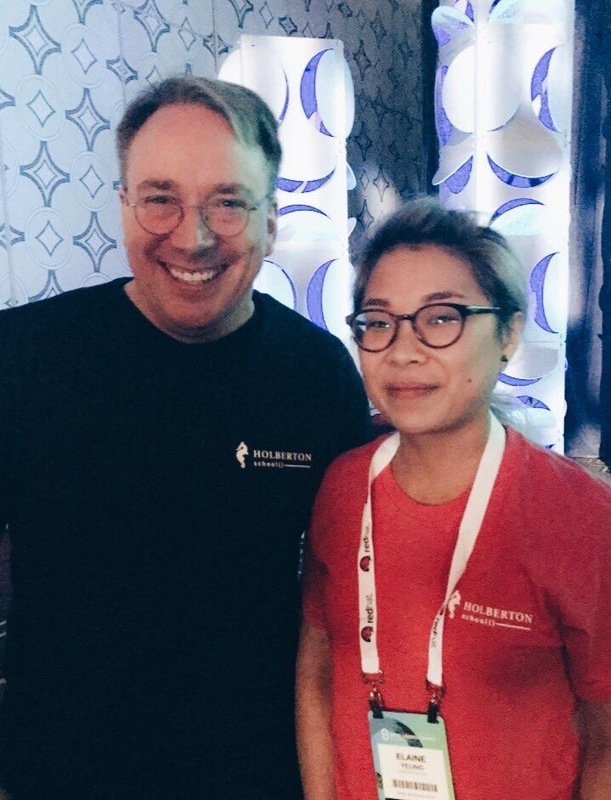 Student, Elaine Yeung, caught the attention of Linus Torvalds, the inventor of the Linux Kernel system, with her rap all about bash. So, when Holberton School co-founder, Julien Barbier, challenged Elaine to take a selfie with Linus in a Holberton t-shirt it was game on. Torvalds graciously obliged Elaine with a selfie and conversation. She walked away from the meeting elated to have been able to meet an innovation legend. 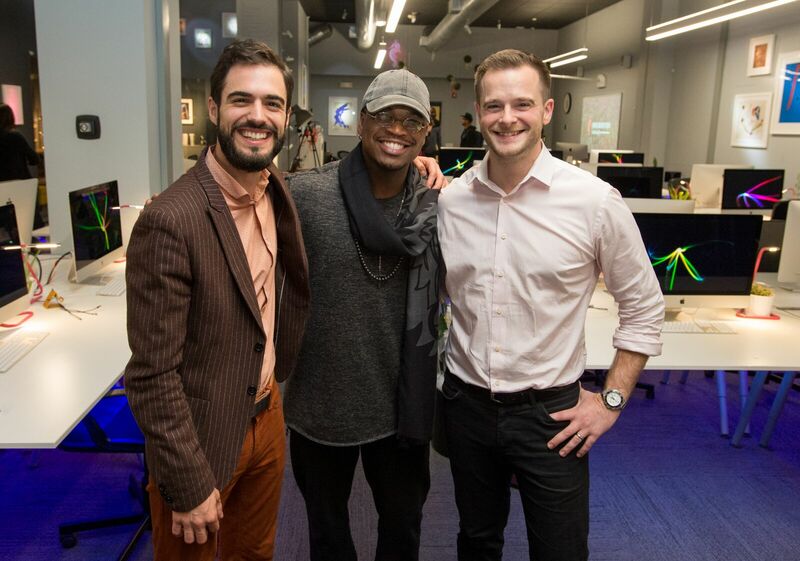 NEYO joined Holberton School’s Board of Trustees. “I just love the fact of what they’re doing with the school — that they’re making it easier for underrepresented people in the world of tech. They’re giving them a platform and access to this knowledge that they probably wouldn’t get otherwise. I think that’s one of the coolest things about this whole situation.” With his support and guidance we are proud to have a diverse student body. 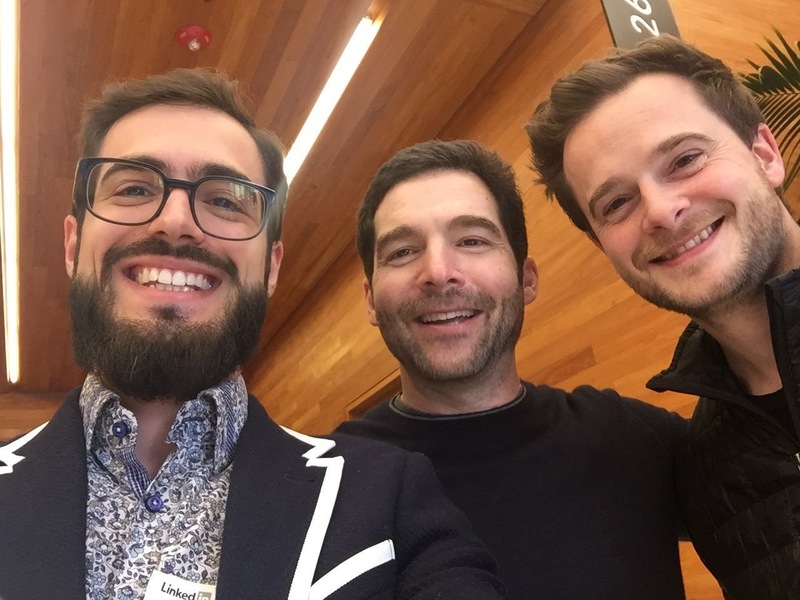 In addition to growing our Board of Trustees, we welcomed the support of LinkedIn CEO, Jeff Weiner, as an investing advisor. We are thrilled at the opportunity to be under the tutelage of Jeff and look forward to working together with him towards fulfilling our mission to provide quality education to the most! We were sincerely honored by Business Insider’s decision to include Holberton School on it’s list of the 19 hottest San Francisco startups to watch in 2018. 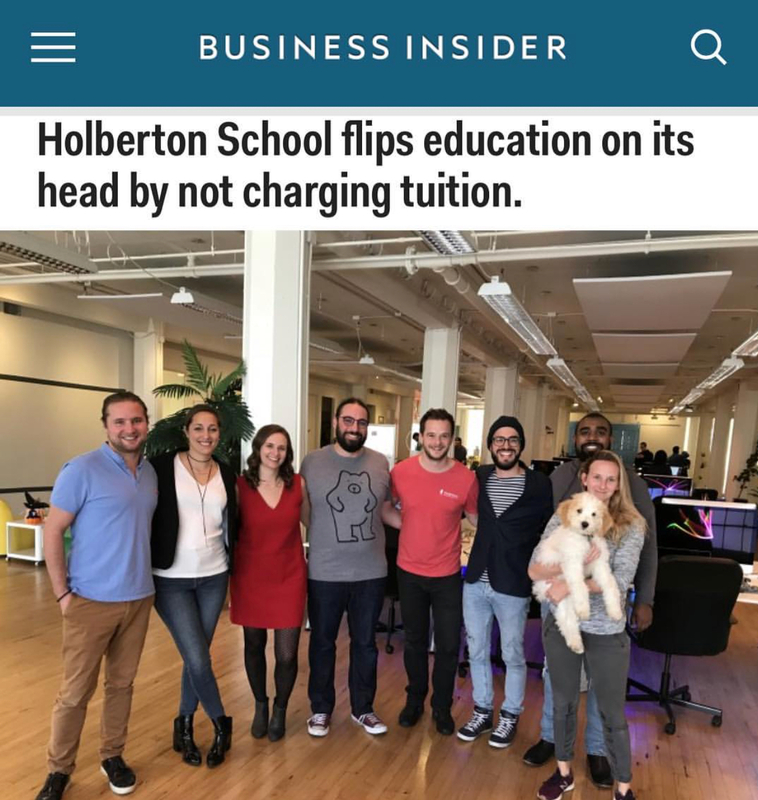 Recognizing us as an organization that “flips education on its head” is something the Holberton team is profoundly proud of. We are currently hiring, check out our open positions! Holberton School staff pose for Business Insider’s list of 19 Hottest SF Startups! Thank you to everyone who played a role in the school’s success this past year, we truly appreciate each and every one of you! We look forward to an even more exciting 2018!